Este tour guiado educativo y entretenido sobre la vida salvaje en el invierno te presenta la hermosa belleza natural fuera de Jasper. Aprenderá sobre la historia y la geología del área con un guía local experto, mientras su cómoda camioneta recorre suavemente las increíbles escenas de la naturaleza. No olvide su cámara para capturar la vida silvestre y la belleza escénica del Valle de Athabasca, el Valle de Maligne y el Lago de Medicina. Aprende sobre los misterios del valle de Maligne con tu guía profesional. 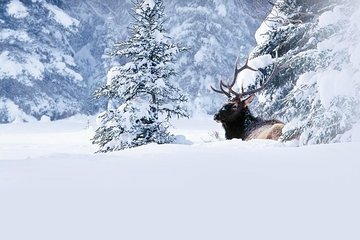 Esté atento a la fauna invernal, que incluye alces, caribúes, ovejas, lobos y coyotes. Recogida y devolución disponible en los hoteles Jasper. We had a great time on tour. Our driver was fun and knowledgeable. He answered all questions with confidence and clearly had good local knowledge. On the boat trip our guides were brilliant at keeping everyone informed and entertained. We chose this tour from a random brochure in a hotel lobby and were thrilled with what we got. Viator booked us in a WRONG tour. We wanted to go to Maligne Valley and Wildlife tour, but the driver guide we saw that morning said we were to go to Maligne Lake and Cruise tour. We already went for the cruise on our own a day before, so went to a short hiking while waiting for others cruising. Very good tour. Our guide was very knowledgeable and was able to track down some wildlife. Wildlife tours are a bit of a lottery, some days lots and others very little and the time of the year affects greatly. Were able to see long horn sheep, bald eagles, deer, ground squirels. Fabulous scenery. Limited critters given the season but our guide (Kevin) was very knowledgeable and interactive - made for a fun tour. We enjoyed this trip and thought it good value for money. The only slight disappointment was that because of failing daylight we were not able to continue up from Medicine Lake to Maligne Lake which we had particularly wanted to see. But all in all very enjoyable.